A comfortable home starts with just the right level of air moisture. 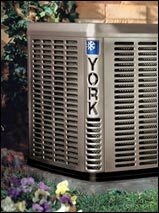 York's Dehumidifier helps keep your home refreshed and healthy. Its nylon mesh filter captures airborne pollutants and dirt, and its easy-access design allows for easy cleaning. Other technological innovations assure long-lasting, trouble-free, quiet operation. And because drier air is more comfortable, you'll actually still feel cool even at a higher air conditioning setting. Optional Wall-Mounted Control - The unit comes with self-contained controls but is easily converted to a dehumidistat control mounted in the living area (similar in appearance to a thermostat), saving trips to the basement or attic to change the setting. Cleanable Filter - A permanent nylon mesh filter captures particulates and airborne dirt to improve indoor air quality; the filter is easily accessed from either side for cleaning. Frost Control - Frost can collect on the coil after prolonged operation or if the home is kept at very cool temperatures. An automatic defrost system will turn off the compressor but allow the fan to operate until any ice accumulation is melted. Once the coil is clear, the dehumidifier will resume normal operation. Minimal Maintenance - The dehumidifier is built for long life and trouble-free operation. Periodic cleaning of the filter keeps the unit operating at peak efficiency. 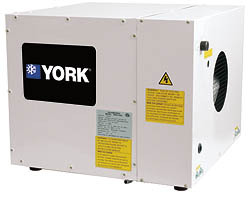 Quiet Operation - The York Dehumidifier is designed for quiet operation. The cabinet is lined with 1" thick high-density, expanded polyethylene insulation that absorbs and reflects sound, keeping most unwanted noise from the duct system and living spaces. The compressor is mounted on rubber isolators to prevent vibration, and the entire unit can be placed on rubber feet or suspended using rubber isolators (optional) to further reduce noise transmission into the home. Energy-Efficient - Because drier air is more comfortable, many people actually raise the temperature setting on their air conditioner when a York Dehumidifier is installed, reducing the load on the air conditioner and helping extend its life. Fits Any Size Home - With a York Dehumidifier, the greater the unit's capacity, the faster the home can be brought to a comfortable level. At 130 pints of moisture removed per day, the dehumidifier is effective in virtually every home and in the most humid conditions.